While only lasting for a few weeks, the field research trip is an intense experience that provides in-depth learnings that go beyond the research outcomes themselves. One of the key highlights for me was how a good field research technique is about combining learnings from human interactions as well as using planning and organisational tools to reduce the uncertainty that surrounds field research. 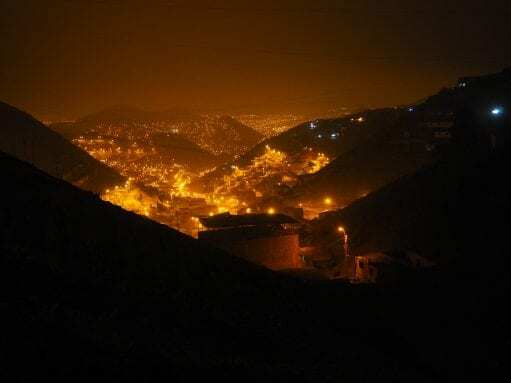 I’m standing here on the dark distant slopes of Villa Lourdes Ecológico, a settlement without water, sewerage or electricity access, looking down at the city of Lima that stretches as far as the eye can see. We have just had a focus group using headtorches with a group of mostly women, their kids playing at their feet. They came to meet us with hope, a hope to be listened to. They feel forgotten and right here, in this dark spot, I can relate to this disillusionment. Since arriving in Lima, I have heard many heartfelt sentences from people who have lost hope and no longer believe in the transformative change we came here to seek. Vicente Chavez, a leader of the fog catcher initiative from this community, wants to move back to Cusco instead of “waiting here, hoping for the water to come from the sky”. 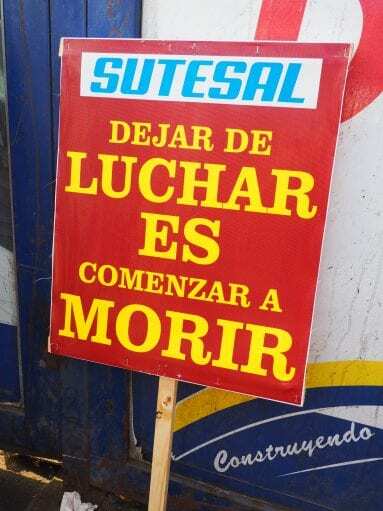 A few days before, at a march on water access, I came across the slogan “stop fighting is to start dying”. Whilst extreme for effect, I do believe that when people feel disheartened about their situation, they stop engaging and driving change. Without pressure on decision makers, they may well be forgotten. I can already observe the direct negative impact of the lack of hope. With the fog catchers project, people lost hope in official support and decreased engagement to the point that they were not making use of a solution that was already available to them. Some community members did not even know that they were entitled to a piece of land to cultivate using water from the fog catchers. And yet, people’s support and buy-in are rarely mentioned in policy briefs as a key prerequisite to foster participation. It appears critical that our recommendations consider how to help restore people’s hope in the potential for transformative change in order to ultimately foster their participation and make them instrumental in their future. Two crucial factors to regain this confidence from the people: transparency and action. Communities explicitly asked for “no more lies” about their situation. They need to understand better the short to long term plans to organise and decide accordingly. Not knowing often means that they linger in the fear of taking action that could damage their current situation. They also need to “see proofs” that improvements are made whether in the form of electricity access or small-scale infrastructure work such as stairs. When projects reach their community, people feel heard and that change is possible thereby increasing their likeliness to engage. This gave me an additional purpose and some guidance for our research. As future planners, we have the duty not only to bring to light these forgotten realities but to also deliver recommendations that aim at overcoming people’s disillusionment when requiring their participation. In other words, the role of a socio-environmental planner is to make sure that no one is left out in the dark without hope. As Lima was my first field research trip I was aware that data collection would be the most challenging phase of the research process. As a project manager, I am used to things being planned from A to Z before a project even starts. As a result, I was fearing data collection as I viewed it as uncertain and unpredictable. Thankfully, I discovered a great ally that changed my perspective and allowed us to bring structure to data collection: networking. I understand networking as interactions with a system of interrelated primary and secondary connections that hold different roles, views and power about a given topic. To have a holistic data gathering, it is important to network with a diverse range of actors of various opinions. However, not all stakeholders play the same role in data collection. In the field, when time is limited, it is vital to be flexible and to learn to also rely on secondary connections. While they may provide a smaller share of information, these connections can be more engaged and transparent. In our case, we met with an engineer working on the ecosanitation project from Sedapal who could be considered as a secondary connection given his operational clout in the project. His insights, provided anonymously, proved even deeper than information provided by the key project partner AguaEcosan. Having recognised the importance of networking, it became critical to integrate it in our research process as a key planning tool for data collection. Recognising that these connections may not always happen organically, it is important to have the methods in place to foster networking and adapt it constantly in the field. Clear research objectives and actor-mapping were critical to framing our networking. By knowing the data we needed, the current gaps and the existing actors we could interact with, it became easier to prioritise connections and make the required substitutions when needed, understanding the implications for our research. 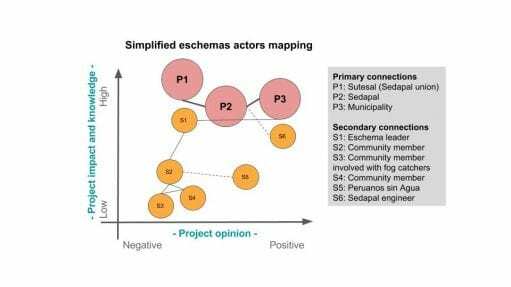 The role of networking as a planning tool for data collection was critical in achieving our research objective to understand better the eschemas model, a publicly-driven city-wide framework from Sedapal to provide water and sanitation services to 100% of the population. Making a direct connection within Sedapal had not yielded any result so we mapped potential actors that could help us gather similar data and decided to network upwards from the communities. We leveraged our existing relationship with the NGO Peruanos sin Agua to connect with a leader from an eschema committee at a water protest march. While the march itself had little importance from a data collection perspective, the contact had the potential to be the missing link we needed to connect with Sedapal as the march was organised in collaboration with the worker union from Sedapal. This allowed us to achieve our initial research goal. First, these key learnings about the methods to network efficiently allowed me to overcome my fear of data collection by understanding that data collection can be planned and is not as uncertain as I saw it originally. Furthermore, recognising the existence of this system of interrelated primary and secondary connections enabled me to use networking as a key ally to engage with these connections and collect data in a holistic and efficient way. Ultimately, this ultimately has a positive impact on the quality of our research outcomes. It is undeniable that pre-research plays a key role in research trips as it allows to gain deep knowledge about a given field of analysis and form initial hypotheses to verify during the research. However, once on the ground, the reality can challenge assumptions and reshape priorities… but after all, research is about ‘trusting the process’. While tools such as networking should be used to help reduce uncertainty, planners should remain flexible and embrace the research journey to gather findings that go much beyond pure research outcomes. Florie Arlegui is a product strategy lead studying for a MSc Environment & Sustainable Development as a part-time student (2015-2017) in order to pursue a career change. She is particularly passionate about sustainable mobility in cities.